Are you bubbling over with holiday to-do's? 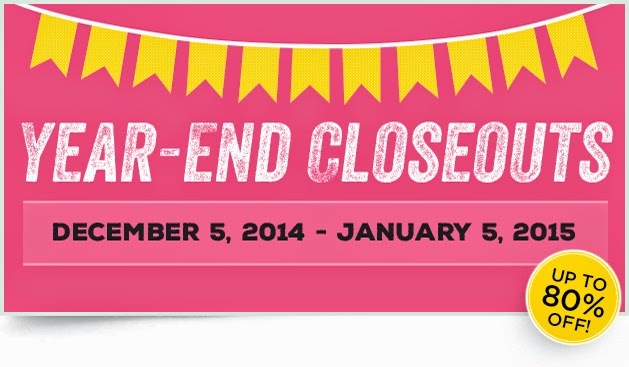 Is your calendar full of holiday gatherings and upcoming New Year's Eve Celebrations? Do you, like me, have nephews that are in their 30's and shopping for them is a nightmare? This quick and simple but stylish hand-stamped Bottle Topper allows you to have the perfect Hostess Gift to the go-to, always in fashion, Holiday gift (from bubbling cider to spirits - these bottles all want to be dressed up!!). 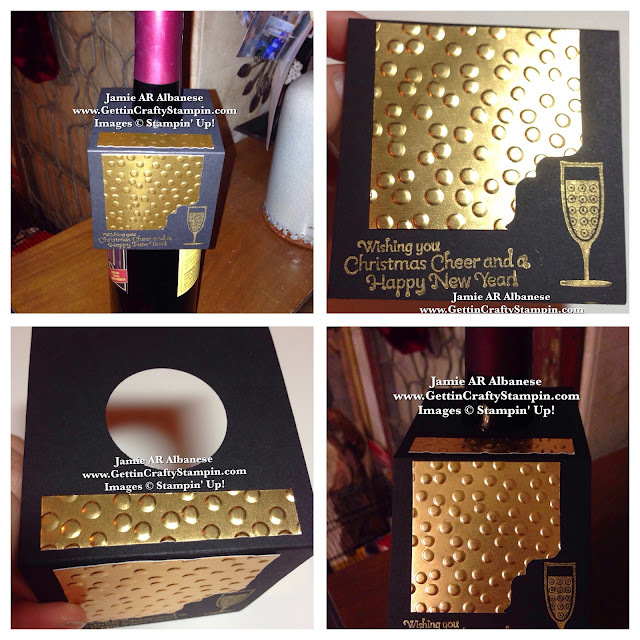 Creating this bubbling gold foil and black topper in mere moments - perfect for that 'I forgot and need a last-minute gift' gift. Take a 3"x 6" Basic Black card stock. Score at 3" and fold. Using the 1-3/8" Circle Punch to punch a hole for the top of the bottle. 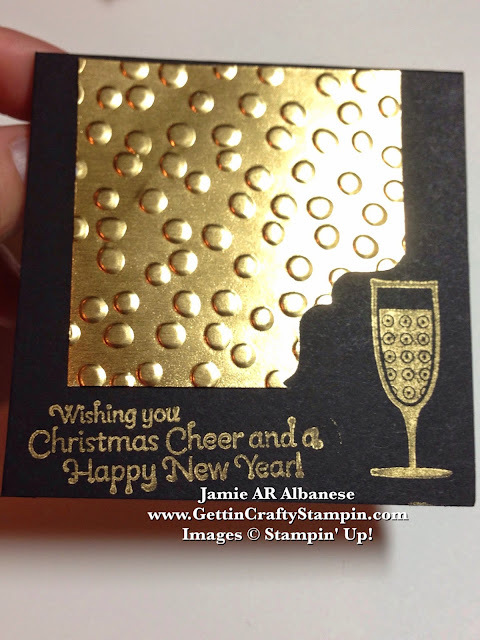 Cut a 2-1/4" square of Gold Foil Sheet. 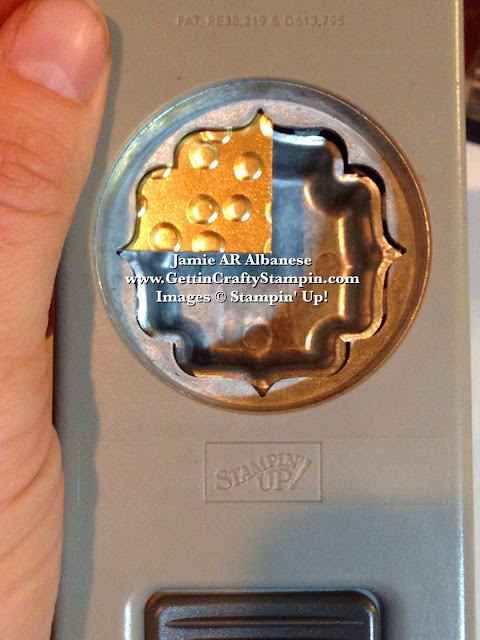 Emboss using the Decorative Dots embossing folder in the Big Shot Die-Cutting Machine. 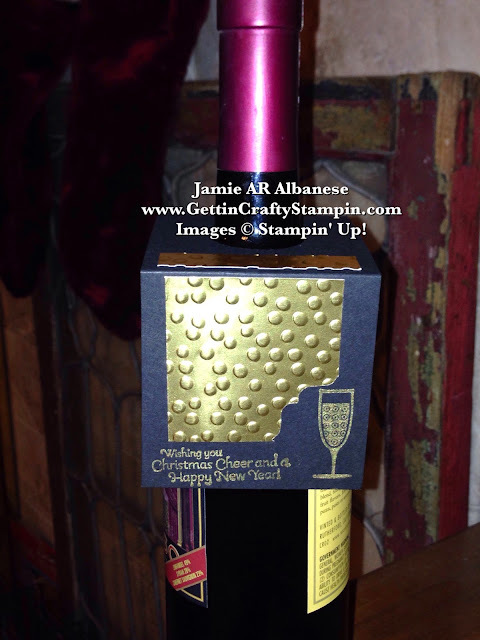 Stamp the Happy Hour images for the Christmas and New Year Celebrations and this bubbling image with the Gold Encore ink pad on the bottom of the Black front. Create a unique frame to this stamped image using the Label Bracket Punch. I love how it has flair while accenting the bubbling glass stamped image. 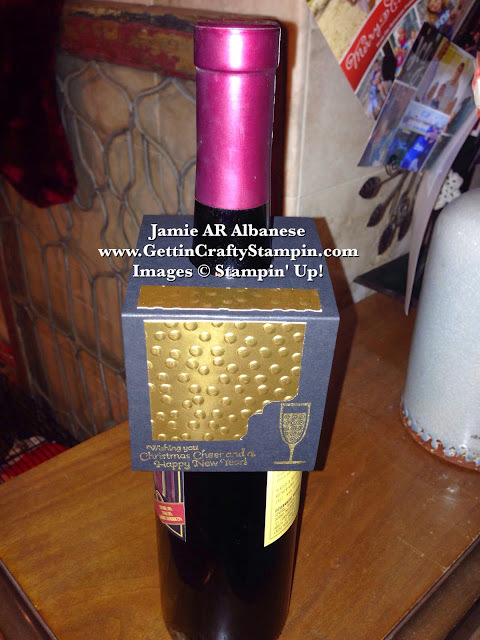 Create a stack of these stylish and easy hand-stamped Wine/Bottle Toppers. They make for appreciated and quick gifts (stock up with some in your card drawer). Dress up your holiday and hostess gifts with a much appreciated glass of bubbly (from ciders to champagne and wine) you can deliver tasty smiles that will be shared with a hand-crafted flair!